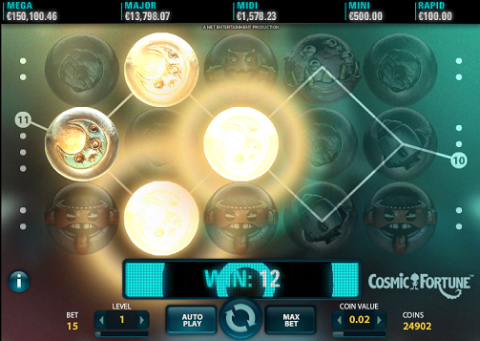 Cosmic Fortune is a new action-packed progressive jackpot slot from NetEnt. In fact, it’s the first ever slot from this major slots game developer to feature an amazing five jackpots. This is part of a growing series of 'Fortune' themed games (the best known is Mega Fortune, which has the world record for the biggest online jackpot payout). When playing this futuristic looking video slot game two of the jackpots will pay out the fixed amount of €100 and €500 for the Rapid and Mini jackpots respectively. The other jackpots are progressive meaning they constantly get bigger as players add to the jackpot amount with every spin. This space-themed NetEnt jackpot game comes with 5-reels, 3-rows and 15 paylines. Both the bet level and coin value can be changed, from the smallest value of $0.02 to $0.50 and you can play between 1 and 10 coins per line. So, regardless of your comfort level, players will be able to enjoy playing this new progressive slot at their desired stake levels. Cosmic Fortune video slot uses the innovative Avalanche feature that you may recognize from other slots games such as Elements The Awakening and Gonzo’s Quest, which is designed to create additional winning paylines and huge wins. It is the norm during the regular spins of the Cosmic Fortune slot to see symbols that make up winning payline disappear and new symbols tumble down to replace these symbols to create even more winning combinations. This explosive Avalanche feature does add an entertaining twist to the play, as a small win can sometimes lead to a much bigger one (no extra coins needed). The graphics, animations and sounds when playing this slot are excellent, with the attention to detail you would expect from NetEnt titles. You’ll also get an additional 5 free falls with each additional scatter symbol that appears during the bonus round. So, keep an eye out for the scatter symbols on the reels, they can easily be identified as they look like a marble with the letter 'S' on it. As soon as the bonus game begins, players can start collecting marbles. The more marbles the player collects, the bigger the chance of hitting the jackpot during the jackpot game. You can win one of the five different jackpots available in Cosmic Fortune if the target is hit three times. This funky looking NetEnt slot also comes with Wild symbols that you can’t miss because they are marked with a golden 'W' symbol. These symbols will substitute for all other symbols except for the Scatter symbols to increase the possibility of hitting a winning combo each and every spin! The Cosmic Fortune progressive jackpot online slot game was released by NetEnt in November 2014. The game is designed to be played via Instant Play mode in your web browser, so you don’t have to download anything. Like all recent NetEnt slots, this one will work great in your mobile devices as well as on laptops and PCs. NetEnt has shown that they are capable of developing the best video slots game on the market, and the release the Cosmic Fortune progressive slot continues to raise that bar. With great gameplay, innovative features like Avalanche and Free Falls features, as well as 3 progressive jackpots to be won, you’d be crazy not to play this new slot. You’ll find NetEnt’s Cosmic Fortune progressive slot game (along with 100's of others from NetEnt, IGT, MicroGaming and more) at the award-winning Mr Green Casino. See www.mrgreen.com to try out this top-rated game.